As a kid I remember spending many of my Saturday mornings in my bean bag chair watching cartoons in the living room. but as I got older (cough) the traditional bean bag chairs are not as comfortable as I remember as a kid. Recently I discovered Comfy Sacks which is anything but the traditional bean bag. I was thrilled when I received the opportunity to review the 6ft. lounger. I was able to select my fabric and color so I went with the Micro Suede in Cocoa . Comfy Sacks offers 3.5,5,6 and 8 ft. bean bag sacks and 5,6,7.5ft loungers. The difference in the Lounger and Sack is the shape of the bean bags. The Sack is round and the Lounger is oval. What makes the Comfy Sacks bean bag chairs different ? They are made with comfy furniture foam not the little Styrofoam beads that were in my bean bag chairs I had in the past. When my bean bag lounger arrived I was shocked on how small the box was. Even though it was smaller than I expected it was heaver than I thought it would be. The 6 ft. lounger weights 49lbs. Above is my Comfy Sack in the box when it arrived and on the right is what was included in the box. The whole process of opening it, setting it up and fluffing up the foam did not take long and the kids had a blast. The Photo on the left shows the sack (with out cover) once we broke up the compacted foam and rolled it around. The next step was putting on the liner which was really easy. The cover has a zipper which makes it simple to put on and take off, the cover is machine washable. YES washable. This is great since I have 3 boys and a dog that like to make a mess. Here are a few photos of us enjoying our Comfy Sack bean bag lounger. As you can see we all LOVE this bean bag lounger (even our dog). This is the go to spot in the living room now. I does not matter if they want to watch TV, play video games, read or take a nap (I have done this more than once) everyone wants a spot on the lounger. I am very happy that it is large enough that more than one person can fit on it or I might have a fight on my hands. Surprisingly my 2 older boys who are 15 & 11 will sit on it together and play video games, most of the time they do not want to be in the same room with each other. With tons of colors and fabric to choose from the Comfy Sack would make a great addition to any room. I am considering getting a 3.5ft sack for each of the boys to go in their bedroom. 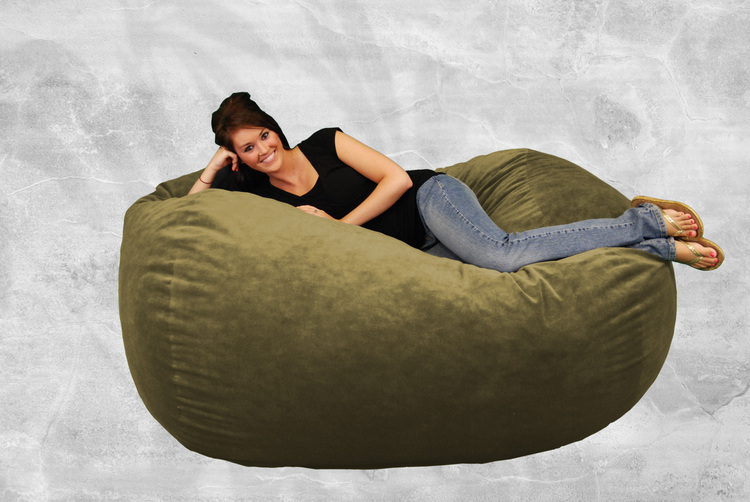 A Comfy Sack bean bag chair would make a great gift this holiday season for almost anyone on your list. BUY: Visit Comfy Sack to purchase online, they also offer additional accessories including a pillow an ottoman. It's like a bed! LOL! Wow, that thing is huge! And looks oh-so-comfy. I am looking for something just like this, not quite as big as yours lol! Sitting in the bean bag chair it's pretty comfy. I'm 5'10 and I can comfortably curl up on it. It works great to put in front of the TV and watch a movie or play a game. I LOVE my beanbag. Its big and comfortable. It is kind of in the way in my small living room but its always in use so that's amazing! would recommend it to anyone who plays video games or has smaller children and a recliner is not big enough.. I like to get down on the floor on there level and this helps because i can sit lower but its way more comfy then sitting on the floor.